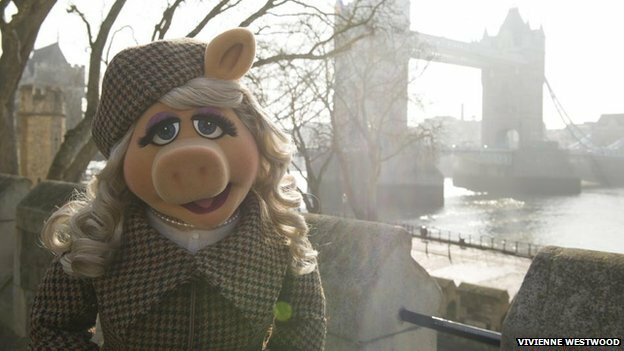 Miss Piggy is the latest star to bring attention to Harris Tweed. Hand-woven on the Western Isles, clothing made from Harris Tweed fabric has already been worn by Ben Affleck in Argo and Matt Smith as Doctor Who. Vivienne Westwood designed the tweed outfit and other costumes Miss Piggy wears in the new Muppets movie, Muppets Most Wanted. Before the movie’s release, Vivienne Westwood posted a picture on the internet showing the Muppet in tweed. The picture was taken with London Bridge in the background. A wedding dress Miss Piggy wears was also designed by Vivienne Westwood. The latest film, Muppets Most Wanted, stars British comic Ricky Gervais. The Harris Tweed Authority welcomed the appearance of Muppets in the fabric. A spokeswoman said: “This is an most iconic partnership of true Hollywood, classic Westwood design and the very finest cloth in the world. Ben Affleck wore Harris Tweed in the Oscar-winning film Argo. Following Argo‘s release, the real secret agent Ben Affleck portrays, Tony Mendez, revealed that Harris Tweed jackets were the “uniform” of CIA agents when working overseas. Sean Connery wore Harris Tweed in 1989’s Indiana Jones and the Last Crusade. For filming in Petra, Jordan, a Harris Tweed pattern was screen printed onto cotton for the Scots actor in hot temperatures.